During the summer, rentals may be reserved one year in advance on a weekly basis. While most summer rentals do fill in advance on a weekly basis, if you are looking for a shorter stay in July or August, please call our reservation staff they will be happy to assist you (860) 886-1944. Please take a moment to read the Strawberry Park Rules and Regulations. For all rental reservations, rates are based on a family of up to 4 Extra persons fees apply beyond the base rate. Click Here for our Current Rental Rates . Non-family rates are based on a maximum of 4 adults. Additional persons registered for the entire length of the camping stay will be charged a per night rate of $12 per adult or $6 per child. Anyone not listed on the registration form and paid for the entire stay upon registration will be treated as a guest at the gate. Overnight guests will be charged at the gate at the rate of $12 for an adult and $6 for a child. There is a maximum of 6 persons in any rental unit, including overnight visitors, and no more than 4 adults. Day visitors must leave the Park by 11PM. Click Here for our Current Rental Rates . Upon registration, a security deposit of $100 will be required. Security deposit may be in the form of a credit card authorization or a check. 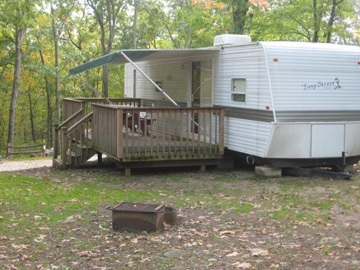 Security deposit shall be forwarded to camper within 14 days of departure, if rental is left clean and undamaged, and after rental has been inspected by Park personnel. 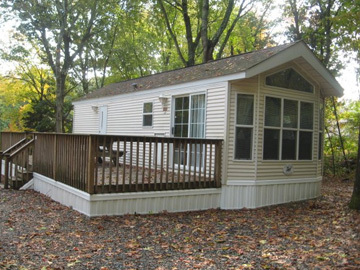 Camper liability for damages to rental units is not limited to the $100 security deposit. Daily check-in time for campsitesis at 1PM in the summer with check out time 11AM. For all rental units (RV rentals, Park Models, and Cabins), check in is 4PM, while check out time is 10AM. Please note that we advise guests to call ahead if you are hoping to arrive early or leave late. Because we generally can accommodate such requests subject to the sites being available ahead of time. 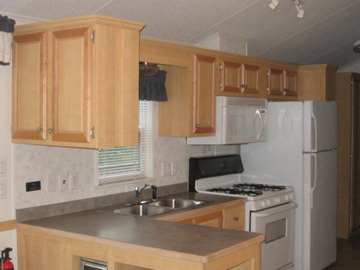 Rental Trailers offer a kitchen area, complete with a range and microwave, a bathroom with a shower, and 2 bedrooms. These units offer air conditioning for those warm summer days, as well as heating systems for cool nights in the spring or fall. 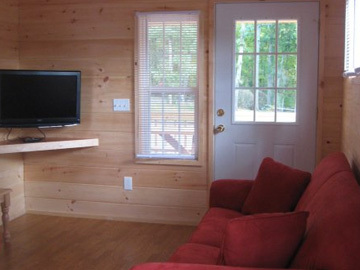 Each site has a picnic table and fire ring, and each rental has a color TV. These rentals are 30-35 feet in length. Pets are allowed with our “Pet Friendly” rentals, a maximum of 2 dogs, each of which must be at least 6 months old and less than 100 pounds. Please be familiar with our “Pet Policy” that applies to all campers. See the floor plan. 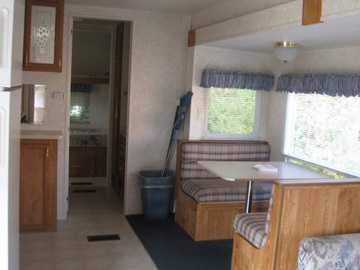 View a photo gallery of our rental trailers. 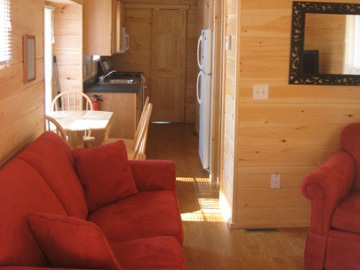 Log Cabins feature a full kitchen and bath, flat screen TV, set of bunks, loft area, porch and deck, queen sized bed, heat & AC, designed for a family up to 5. See the floor plan. 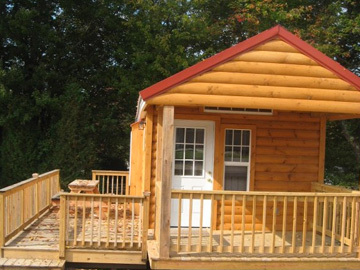 View a photo gallery of our Log Cabins. Park Models are 34 feet long and 12 feet wide, a bit larger than the rental trailers. The full kitchen comes with a range and a microwave, a full bathroom with shower, and two bedrooms. 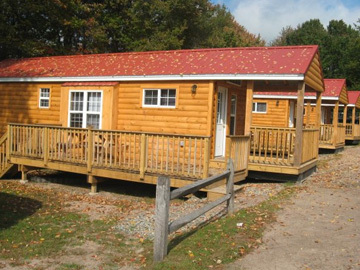 Central heat and AC are provided, and each Park Model has a color TV, while each site offers a picnic table and fire ring. See the floorplan. See the floor plan. View a photo gallery of park models.